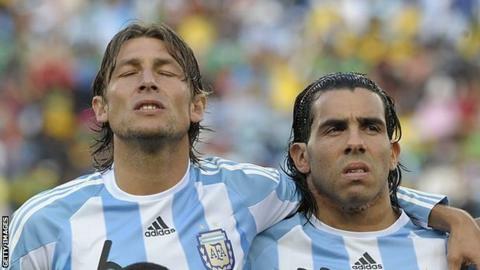 Ex-Premier League players Carlos Tevez, Dirk Kuyt and Gabriel Heinze have been named by hackers Fancy Bears as three of the footballers cleared to use banned medicines at the 2010 World Cup. The trio were among 25 players given therapeutic use exemptions (TUEs) during the tournament in South Africa. In its latest leaked documents, the Russian hacking group also claims 160 players failed drugs tests in 2015. Four of the failed tests were registered by UK Anti-Doping (Ukad). Three players tested positive for cocaine, and one for ecstasy. This is the first time Fancy Bears hackers have released details about TUEs in football. Tevez, now 33, was playing for Manchester City during the World Cup in 2010 having moved from Manchester United the previous year. His former Argentina team-mate Heinze, 39, was playing for French club Marseille, having previously spent three seasons at Old Trafford. Dutchman Kuyt, 37, was at Liverpool. There is no suggestion any of these footballers have done anything wrong. The latest hack includes an email from the Football Association's head of integrity, Jenni Kennedy, to the sport's world governing body Fifa. The FA said it was "disappointed that strictly confidential information has been released into the public domain" given the details in the email related to ongoing investigations. It added that whenever doing violations are uncovered, it released full details on its website as a matter of course. Fifa said it condemned "in the strongest terms" the release of material it said was obtained illegally. "The release of such information constitutes a clear violation of the athletes' privacy and puts at risk the ongoing fight against doping," it added. Nicole Sapstead, chief executive of Ukad, echoed Fifa's condemnation adding that "the theft of medical data is completely unacceptable and this leak does not advance the cause of the anti-doping community at all". Who used what during the 2010 World Cup? Tevez, Heinze and former Manchester United and Argentina midfielder Juan Sebastian Veron were prescribed betamethasone - a corticosteroid with a variety of uses. It does not feature directly on the World Anti-Doping Agency's (Wada) prohibited list, but is banned depending on the strength of the dose used. Kuyt, who retired from football in May, used dexamethasone, apparently for pain relief because of tooth problems. Germany international Mario Gomez needed salbutamol, which is a common asthma medication. Ex-New Zealand, Blackburn and QPR defender Ryan Nelsen, who is listed as 'Nelson' on the published form, declared the use of prednisone, another corticosteroid. There were no England players among the 25 names released by Fancy Bears. A TUE allows an athlete, for medical reasons, to take a prescribed substance or have treatment that is otherwise prohibited. Athletes must contact their national governing body before applying for a TUE. The athlete would suffer significant health problems without taking the substance. It would not be significantly performance-enhancing. There is no reasonable therapeutic alternative to its use. The need to use it is not due to prior use without a TUE. Ukad says it has "a number of robust controls in place to make it as difficult as possible" for athletes to misuse the system. Fancy Bears first hacked the Wada database last year, and in September began revealing athletes' confidential details and information regarding TUEs.
British cyclist Sir Bradley Wiggins was forced to defend himself in the face of scrutiny following the leak of his medical records. The IAAF - athletics' world governing body - then said in April it was hacked by the group earlier this year. Mo Farah, Helen Glover and Justin Rose were among the British athletes who had their medical files made public. It was inevitable that Fancy Bears would eventually target the world's biggest sport, perhaps the only surprise being that it took so long. The statement on the Fancy Bears' website promises to prove that players and officials are "lying" when they "unanimously affirm" that football is free of doping. But, while concerning, this release is not exactly earth-shattering. There is no suggestion that any of the World Cup TUEs involve wrongdoing - but it may reignite the debate about whether the system can be abused.